Well-drained soil of average fertility. None. 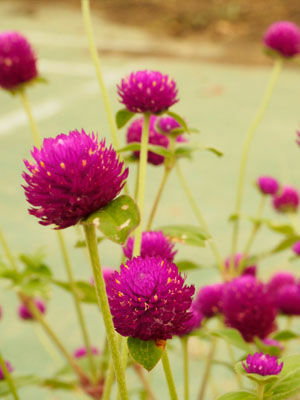 Gomphrena is a warm-season annual. Mix a light application of a balanced organic fertilizer into the soil prior to planting. In midsummer, drench plants with a liquid fertilizer to prolong bloom time. Celosia. Because of the unusual round shape of gomphrena flowers, they provide great contrast in form when combined with annuals that have upright spikes or flat, daisy-shaped blossoms. Sow gomphrena seeds indoors to get a head start, or outdoors where you want the plants to grow at about the time of your last spring frost. Many gardeners purchase gomphrena seedlings as inexpensive bedding plants. Allow 12 inches (30cm) between tall varieties. Gomphrena stems make long-lasting cut flowers. In warm climates, gomphrena sometimes reseeds but it is never invasive. Colors include purple, white, and orange. Gather blossoms to use as cut flowers just after they open. If you like dried flowers, harvest blossoms when they have good color, strip off the leaves, and hang them to dry in small bunches in a dry, well-ventilated place. Tall varieties grown as cut flowers may need staking. Late in the season, tired plants often develop leaf spots of powdery mildew.